At a time of constant change, how can businesses spot the right opportunities and maximize return on their efforts? 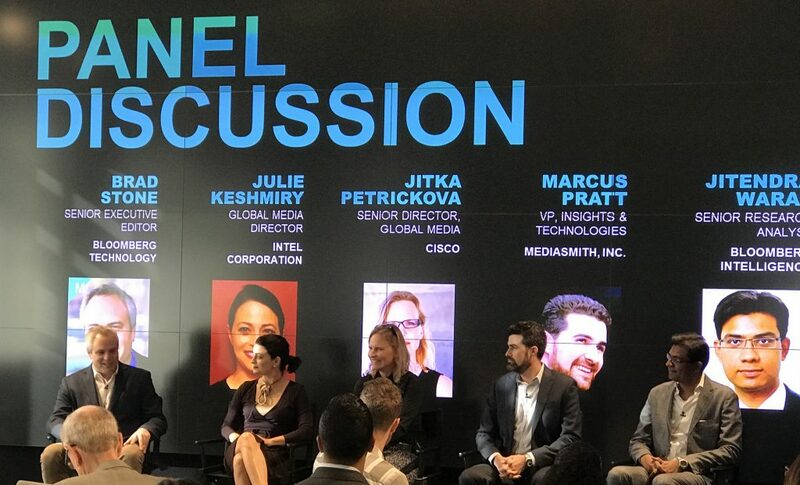 To explore that critical question, Bloomberg Media Group gathered a group of tech industry leaders for a data-infused discussion recently in San Francisco. 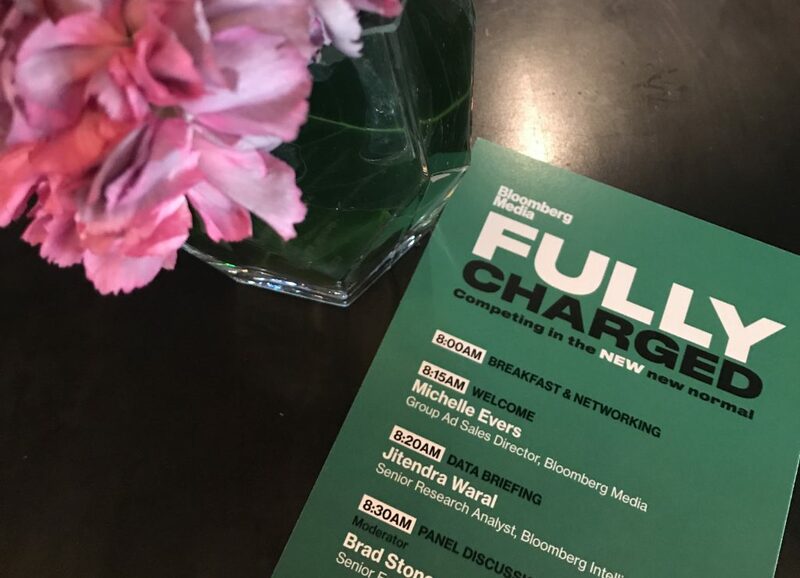 Bloomberg Media Group Technology Practice Lead Michelle Evers welcomed guests to the inaugural Fully Charged breakfast event. Bloomberg Technology Senior Executive Editor Brad Stone moderated a high-powered panel that included Intel Global Media Director Julie Keshmiry, Cisco Global Media Senior Director Jitka Petrickova, Mediasmith VP of Insights and Technologies Marcus Pratt, and Bloomberg Intelligence Senior Research Analyst Jitendra Waral. Waral, who has been analyzing the tech industry for the investment community for more than a decade, kicked off the morning with a briefing on key technology trends – and how marketers should be acting on them. Virtual reality (VR) and augmented reality (AR), for example, have been trending topics for some time. 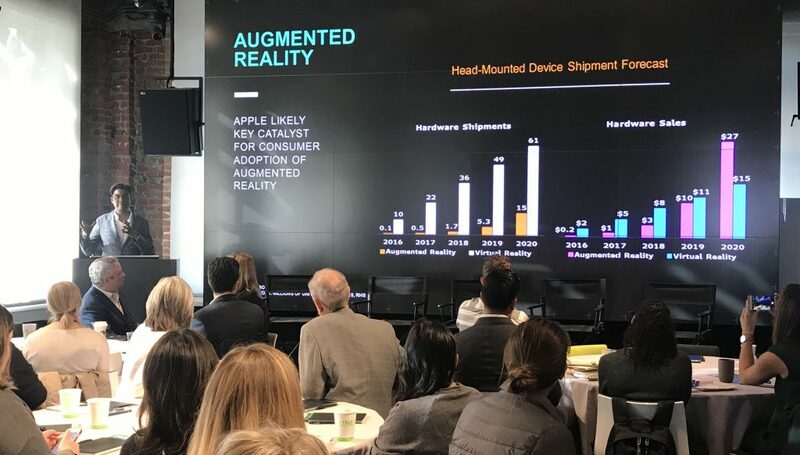 Mapping a host of variables – from supply chain to bandwidth and hardware requirements to whether anyone really wants to wear a headset – shows that marketers can afford to wait on VR, Waral said. AR, on the other hand, is something marketers should be thinking about right now. It uses platforms that already exist – and it’s already accepted as a fun, non-interruptive experience by consumers. “The customer becomes the marketer with Snapchat,” Waral observed. But more important than AR for marketers is AI – artificial intelligence. “Think about AI as a tool to scale human cognition,” Waral said. AI won’t replace job functions, but jobs that use AI will replace those that don’t. Digital assistants will become a day-today command center for most people. “The market for these devices will be over 700 million homes by 2019,” Waral said, pointing to a coming sea change in consumer behavior. With personal computers, choice was abundant; but with smartphones, Waral noted, 90% of time is already spent in three apps. With digital assistants, choice shrinks even more. Those assistants will be powered by data – and the systems built on that data. “AI and measurement is the one trend marketers must pay attention to – otherwise they will be left behind,” Waral continued. With most of the world’s data held by just six tech companies, all businesses need to ensure they are part of the data ecosystem. Bloomberg’s Stone – whose dedicated team of 50 journalists covers tech developments across the globe – then opened up a wide-ranging conversation on what’s coming next with the panel. As disruption continues at an ever increasing pace, he pointed out, marketers must also grapple with new questions in media that stem from the rise of platforms – including brand safety, fake news, and measurement issues. When it comes to making media spend recommendations, Mediasmith’s Pratt added, new channels can be flashy, they’re not necessarily proven. “Any time you’re doing a test, make sure you can measure the results of the test and learn something,” he said. Waral agreed that today’s environment is challenging. “The code isn’t cracked yet in terms of agreed-on standards of advertising,” he said. When that happens, he added, growth will explode in areas like video – but right now, investing in data infrastructure critical. “Rethink your data strategy. Rethink your data sources,” he said. But while measurement is critical, so is creating human connections. “The way we advertise is going to die,” said Petrickova. Streaming video, VR, AR and other technologies will shift the landscape in ways that change how marketers interact with audiences. “The future is all about how we are talking to customers through our content,” she added. Bloomberg’s Waral noted that the shift toward curated content can help solve both measurement and targeting challenges, allowing marketers to get relevant messages to the right audiences where they are, in ways they want and need – be they millennials or business decision makers. AI systems will be a big part of that – but we’re not completely there yet, Pratt said. There isn’t always robust, clean, actionable data, for example. “If we’re going to have AI that’s giving serious input on how to spend media dollars, we need to see the entire picture,” he said. If a system is just looking at banner ads on a website, there’s potential for false signals. But she’s bullish on what AI systems will be able to do for dynamic audience segmentation and creative. New technologies can move marketers from building dynamic creative on an “if, then” principle to creating messages on the fly that cross-reference something about a person’s social feed in real time, for example. “My message to everybody is to start experimenting now,” she said.